Elite Dangerous MicroGuide #1 – Where to Start? Frontier Developments space trading epic Elite Dangerous can be an intimidating game to face initially as the in game tutorials only scratch the surface of what to expect. They are worth doing though as they have improved massively since launch and will give you a taste of the tasks that may be required of you when playing. But if you’re looking for more, thankfully the Internet steps up with a lot of resources for finding exactly what you need. One of your first ports of call should always be the Frontier Forums – if there’s a problem or question asked about the game it’s likely to have been covered here first. And if all else fails you can give the manual a shot – an early version can be found here. What follows is some of our own experiences and recommendations that might help to get you going. And if there is something handy we’ve found elsewhere that’ll help out too, we’ll link to it. We can’t cover everything and if there is something else you think might be worth sharing, please let us know and we’ll update this accordingly. UPDATE: Grocs has now added a few of his own tips to the guide. Now references the PlayStation 4 release too. 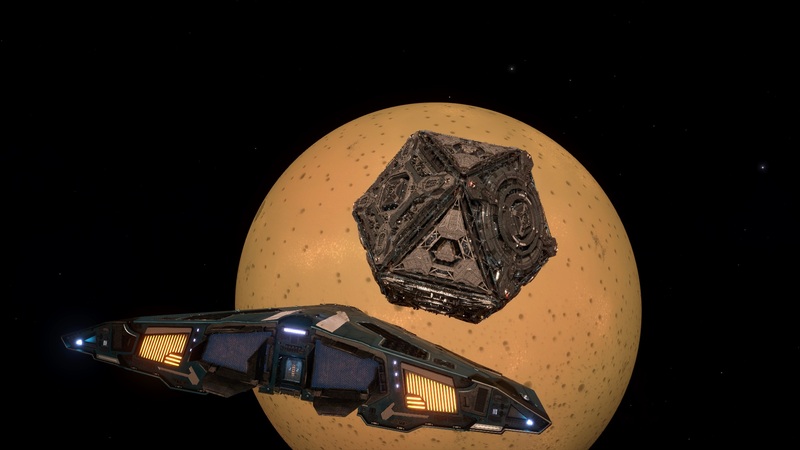 So… what is Elite Dangerous? 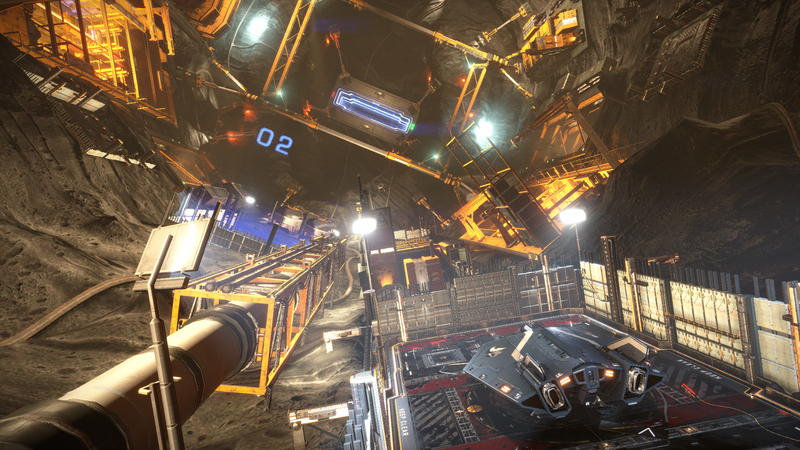 Elite Dangerous is a space simulation, literally. The players is given a spaceship (the tiny Sidewinder by default) and has the whole galaxy to explore but to do be able to do that successfully they will have to find a way to make a living by either legitimate or illegitimate means. There is no narrative for the player to follow: it’s completely up to them what they do. So if making a living shipping goods into deep space is your thing, you can do it. Earning money by becoming an intergalactic bounty hunter? Yes you can. Be on the wrong side of the law and become a smuggler or pirate? Totally. Space can be a lonely place so if you have a handful of mates with the game, you can all join up in a wing of four and fly together – completing tasks and earning money towards that next big ship you’re all eyeing off. It’s all up to you. The game is available on PC, Xbox One and PlayStation 4. For a while the initial console version (Xbox One) lagged behind in terms of content but they are all at parity now which means your choice of platform no longer needs to take this into account. If you have a decent spec PC you can benefit from higher resolutions, faster loading and even VR support. The Xbox One version would compare to a low-medium detail PC version but also takes advantage of Xbox Live friends lists to make the multiplayer aspect far easier to manage. It was recently updated to support 4K resolutions if you are running it from an Xbox One X. The PlayStation 4 version is comparable to its console cousin and if you have a PlayStation 4 Pro you’ll also have access to the same additional performance and quality options as the Xbox One X. Note that all versions don’t allow cross-play at this stage so you’ll need to choose the one that best serves your gaming needs. For pick up and play convenience, the console versions work nicely and handle well thanks to a great controller setup (see below). If you want the best looking and handling version and feel like you’ll be committing to the game in the long term, the PC version will give you that; those especially dedicated might even be able to get involved in betas for future content updates. When the game begins you’ll find yourself docked at a station in a small ship with loaner equipment and just a few credits to your name. As a certain H. Solo once said “she might not look like much but she’s got it where it counts” and your little ship seems like it is more than enough in the beginning but don’t be fooled by those false impressions otherwise you’ll learn some very expensive lessons. For starters you’ll likely end up in something like a Sidewinder or Eagle which are cheap, small and nimble. They are also on the wrong side of brittle in a battle. But when you are short on credits that kind of ship can come in handy while you are learning the ropes and working on your flying skills. When learning to land that’s exactly the kind of ship you want to be risking in the to beginning. But as you gain experience you’ll soon need to look after your ship and to upgrade it often. The default components bundled with a new ship are the lowest spec versions available so look to buy the parts that best suit your needs via the Outfitting menu which can be found through System Services when docked at an appropriate space station. You probably can’t do much in the beginning but it’s worth keeping it in mind for later. Parts are broken up into tiers ranging from 1A to 4E with the number indicating the size of the part and the letter it’s quality. Ships have limited space within them so it’s safe to assume there will be little room for the big stuff in a tiny ship. But if you can spare the room, definitely get a docking computer as it will save you a lot of time and frustration during landings… especially if you are a bit rusty on the flying side of things. Grocs – The rating system is interesting. E is definitely the lowest powered item, while A is the best. The higher the number (I’m currently running a Python that has 7 rated slots) the more powerful equipment you can put in. When you are upgrading make sure you don’t exceed your ship’s power rating for “deployed”, otherwise modules will fail to load and you could be a sitting duck in space. Night Owl – There’s one unique aberration with the ratings system and that’s D rated parts are often lighter than the A, B, C and E versions in that tier. For new players wanting to reduce the mass of their ship and extend their jump range this could be an easy way to achieve that. I usually find upgrading life support from E to D an easy (a cheap) win. Your ship is an extension of yourself within the galaxy so keep it running well. My preference early with my ship configurations was to build them towards fleeing over fighting so I aimed for the best powerplant, thrusters and frameshift drives I could fit onto my ship. Updates to the outfitting screen since the 1.6/2.1 update help more than ever in finding what you need so for my “runaway!” vessel I was keeping an eye on top speed and jump range as the faster you go and the further you jump can make you a difficult prey to catch. When you are making money through smuggling and courier missions, being nimble also helps in avoiding being scanned by stations and other ships. 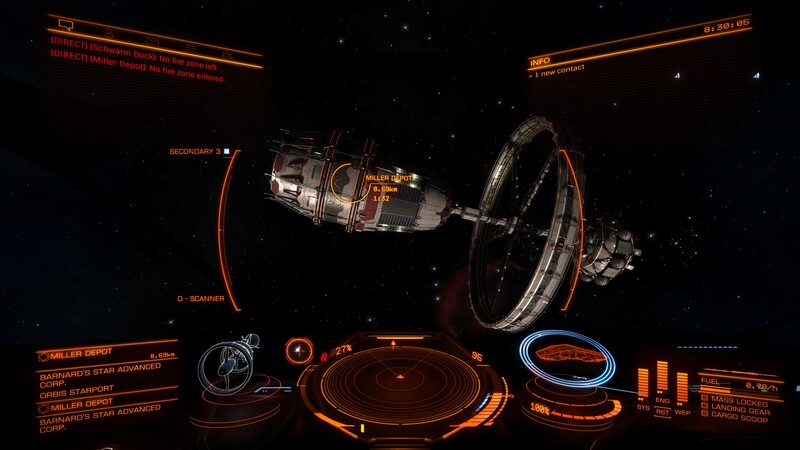 It’s definitely worth practicing quick station landings – those stations that require the pilot to fly through a docking port to land (such as dice-like Coriolis stations) can only scan you from the outside so if you can enter the port quickly you can get those illegal goods through and avoid a fine. With money being scarce to start with it might feel like all your earnings are going into repairs, fuel and ammo but once you start improving your ship’s capabilities your ability to earn more will increase too. Soon enough you’ll start making enough money and find those bigger ships tempting and they definitely are. When you do make the purchase you can buy it outright or trade in your old ship and score a discount. Grocs – You will actually recover more money selling all your upgraded parts back to the default ones before trading the ship in. Example – I sold all my hard points, utilities and upgraded core and optional components for my Federal Dropship. This netted me an extra 4 million credits that I would not have gotten had I just traded the ship in for my new Python. It takes a few minutes but is well worth the time. But like it is when you first start the game your new ship will need to be upgraded a lot before it becomes your ideal trading/hunting/smuggling vessel. My next ship turned out to be the Cobra Mk III which I think makes for a good all rounder vessel but might make you look for something bigger for those wanting to pack bigger guns when they are hunting. Those on the Xbox One version can also get an achievement if they own ten ships at once, but managing a fleet is a fiddly task as you still have to travel to the system where you’ve left each one docked to swap, sell or trade them. If you do choose to keep your ships you have the option of having them transferred to your current station so that you can swap and leave your current one docked. This is useful if you have some ships configured for mission specific tasks such as mining or bounty hunting however these transfers come at a price. There is a waiting period before you can receive it (for me around twenty minutes) and the cost is relative to the distance and value of the vessel. The PC version offers a massive amount of control options for pilots from mouse and keyboard to controllers all the way up to HOTAS (Hands On Throttle And Stick) combinations. All of these are fully configurable, so you can mix and match to your liking too. For those players wanting to have everything in the game only a key press away, a really awesome keyboard guide can be found here via the Frontier Forums. The easiest way for me to get into the game though was with the controller (360 or Xbox One); using the default controller profile provides a set of context sensitive options (displayed on screen which is very useful) that cover most of the keyboard commands out of the gate. Since the profile is very similar to the Xbox One version it makes jumping between versions of the game a snap too. It might seem like heresy to recommend a controller for playing ED but Frontier have done a really great job of packing a lot of functionality into it. And you don’t need to remember a pile of keyboard short cuts or configure a HOTAS setup. But still… if you have money to splash out on a neat flight stick and throttle, you’ll be able to get a lot out of them with the game. UPDATE: the PlayStation 4 and Xbox One versions of ED now support HOTAS controllers such as Thrustmaster’s T.Flight HOTAS One. So if you do want that level of control in the game you’re no longer constrained by platform. Getting out there and figuring out the game by trial and error might not always get your where you want to be in Elite Dangerous. The game’s training scenarios have improved immensely over the years (much better than they were at launch) but might not cover everything you want to be aware of. Some of this is offset though by Frontier’s own training videos which you can see below. Please note that these don’t take into account any content changes since the launch of the Horizon expansion. Grocs – using the galactic map can be un-intentionally harder than it needs to be. For example you can filter out types of planets that you don’t want to appear on the map. Say for example you are looking for a “High Tech” planet. You can filter all other planets to find the light blue “High Tech” planets easily in the galactic map. The downside? If you forget to turn all the planets back on in the filter you’ll not be able to lock onto that planet without manually typing the name. On the Xbox One this is very painful so remember to turn all the filtered types of planets back on so you can easily select the planet you are intending to fly to for your next mission. Night Owl – There are route plotting options in the galaxy map which allow you to choose either the fastest or most economic way. The former burns through fuel faster (longer jumps means more fuel) while the latter uses much, much less. If you cycle between the two during a long trip the route plotter will automatically update which can help you get through areas of space where you can’t refuel. Grocs – make sure you set the map filters back on otherwise you’ll not be able to select the planet. ObsidianAnt and Kornelius Briedus both have prolific ED YouTube channels that offer plenty of tips and insights into the game. Calling them “substantial” would be an understatement; I’m astonished with how much information and guidance that the community has been able to provide. See the below for a couple of examples but please check out their channels for deep dives into aspects of the game itself. Once you get out of that station for the first time you’ll find places such as these real lifer savers. Next time we’ll try to talk about our own experiences in making and losing money in Elite Dangerous. Until then, see you out there in the black.